Modern world is shaped by modern science. So it is little wonder that scientific revolution of the 17tth/18th centuries is a topic of huge importance for historians of science. That the revolution took place in Europe places focus on the structure of the European society and the prevalent culture, as well as questions about the places where this revolution in thinking did not take place, such as in Muslim areas or in China. A few years ago, two scholars went at each other on this very issue. 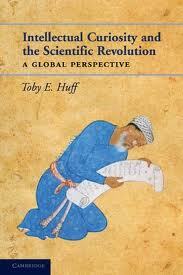 The occasion was the publication of The Rise of Early Modern Science: Islam, China, and the West by sociologist Toby Huff. It is an excellent book and among other things he points to key structural differences between European universities and the Muslim madrassas of the same era. For example, for various reasons the curriculum in universities got standardized, whereas madrassas maintained learning focused on individual scholars, and therefore often lost continuity after the death of the scholar. Then historian George Saliba wrote a review of Huff''s book. The review started with some praise but quickly became quite critical of Huff's ideas. Well, Huff then wrote a response to the review, which in itself was quite critical of Saliba's views. Saliba then wrote a response to the response - and by then, the gloves were completely off. This is classic academic sparring! I actually give my students this exchange and we usually have a fascinating class discussion on the topic. In case you are wondering, last time the class was split - with half supporting Saliba and the other half Huff. Saliba has his own strong views about the reasons why scientific revolution did not take place in the Muslim world. He thinks that it is not that the sciences declined in the Muslim world (and in China), but rather that Europe outpaced others. One of the prime reasons for this was the influx of money from the "discovery" of the new world, and provided funds for the establishment of scientific societies. The concept of patents - so disliked in the Muslim world - also allowed innovation to spread in Europe (this is a post renaissance development). In any case, George Saliba presented some of these ideas in Islamic Science and the Making of the European Renaissance. I actually like this book too - especially the last chapter, where he talks about the causes for the scientific revolution in Europe (you can also see these views on our Science & Religion Lecture: Islam and the Transformation of Greek Science) . I think, truth lies somewhere in between these two ideas: Yes, there were external factors (such as huge money influx from the new world) that helped Europe, but then there were also some internal factors (legal frameworks, space for expression, etc) that ended up being advantageous over the long run. Why have some human societies achieved greater scientific accomplishments than others? In Intellectual Curiosity and the Scientific Revolution, Toby Huff takes a cultural perspective to explain Western dominance in the sciences. Distinguishing engineering prowess (such as the construction of hydrological systems) from scientific inquiry, he argues that a “curiosity deficit” in the Orient led to scientific stagnation there. Huff (a sociologist who has turned to the history of science) begins by laying out evidence for Western ascendance in the sciences during the late 16th and 17th centuries. Showing little patience for those who romanticize oriental equivalence in scientific achievement, he convincingly argues how key scientific discoveries (from the laws of planetary motion to anatomical function) were largely products of occidental science. He further challenges the notion of collective learning through colonialism by noting that much of the West's colonial ventures in the East began much later (in the 19th century). Focusing on Chinese and Islamic societies, he argues that most consequential knowledge transfer that occurred was in fact from West to East, particularly by Jesuits in China. A case study of the invention of the telescope provides the book's core example of Western scientific superiority. Using rigorous historical analysis, Huff carefully traces the knowledge of optics that led to this instrument and the subsequent transfers of the science and telescopes to China, India, and the Ottoman Empire. He offers ample allusions to primary texts and illustrations alongside critical appraisals of secondary commentaries. Huff supplements this core case with considerations of the invention of the microscope, the development of microbiology, and the evolution of early physics (particularly pneumatics and electromagnetism). The knowledge of these discoveries, he argues, was conveyed across the Muslim and Chinese realms but led to little further innovation. Although Huff gives credit to notable inquisitive researchers in the Islamic tradition (such as Ibn al-Haytham in optics and Ibn Bajja in the science of motion), he takes the inability of such stalwarts to create a larger scientific enterprise in their societies as indicating a systemic cultural problem. The original scientific achievements within the Islamic tradition largely occurred between the 10th and 12th centuries, when there was a willingness for collective learning and a transmission of Greek texts to Western Europe. However, the commendable contributions of the “Arab masters” in areas such as trigonometry were confined. Like earlier Greek discoveries, Muslim contributions to science atrophied and did not lead to historically transformative inventions. Huff also convincingly dismisses specific claims of Arab scientific influence on the West, such as the impact of Nasir al-Din al-Tusi on Copernicus. One senses a strong undercurrent of Protestant exceptionalism throughout Huff's narrative, in keeping with his earlier work and admiration for Max Weber (1). He claims that religious impediments to science were less substantial in Europe than in other parts of the world and that episodes, such as Galileo's conflicts with the Church, have been overplayed by historians. Despite many tensions, Christian Europe had a greater capacity to accept scientific enterprise. Referring to Martin Luther's Wittenberg campaign, Huff comments that “it is extremely difficult to imagine an Islamic scholar” of the 16th or 17th century “posting such a challenge on the door of the Great Mosque in Damascus.” In this context, he might also have discussed the role played by clergy such as Gregor Mendel and Thomas Malthus in scientific discovery. Read the full article here (you may need subscription for full access). But I can't wait to see a review of this book by George Saliba. Or even better: a new book by Saliba on scientific revolution. Saliba told me in late 2009 that he was working on a new book on why science developed in Europe and couldn't develop anywhere else, and that he expects to finish it by 2012-2013. Good news, Benjamin. And thanks for the heads up on this new work from Huff, maybe I can check it out over the summer. Saliba's argument that it was the resource influx into europe from the americas that spurred the scientific revolution has always struck me as somewhat lacking. The impression one gets from reading general histories is that many regions in africa, the middle East and asia were quite affluent as well; after all, europe cannot be seen as truly outpacing other parts of the world economically until well into the 18th, in many ways the 19th century. How can such a blatantly racist book get published?